“May I join you on your vacation to Sri Lanka?” my best friend asked me out of the blue. Since we had travelled together before, I readily allowed her to accompany me. She seemed relieved. I knew that her two-year-old relationship was going through a rough patch—on one hand, she was in love with her boyfriend, and on the other hand, their religious differences seemed irreconcilable. Both were conservative individuals with strong opinions and neither was willing to give in easily. Perhaps, she felt, a holiday would clear her thoughts and do her good. So, we booked her tickets to Sri Lanka and were all set. This vacation together was a tad different from the earlier ones. Even after landing in Colombo, she seemed lost in her own thoughts. She wasn’t her usual cheerful self. So, when a local tour guide suggested a midnight trek to Adam’s peak, I was instantly sold. An adventure, I felt, would cheer her up and help her forget her problems. So, the following day, she and I headed towards the quaint town of Dalhousie, the gateway of Adam’s Peak. We checked into a budget hotel there and geared ourselves up for the midnight trek. Upon arriving at the base of the hillock, we realised it was the pilgrimage season. And, therefore, the entire trail, comprising 5000 plus stairs, was illuminated by a string of lights. Several tea shacks and stalls lined the pathway. It should be a piece of cake. How hard can it be to climb a fleet of stairs dotted with eateries and shops? I thought. But little did I know that Adam’s peak would prove me wrong. The first leg of the trek was easy—the ascent was gentle, and the stairs were wide. I could alternate between climbing and walking. We took it easy, interacted with eager hawkers and stopped to admire colourful prayer flags that swayed in the night’s cool breeze. However, the second leg of the trek, after the Peace Pagoda, got intense. The steps gradually became narrower and narrower, and the ascent too became steeper and irregular. We huffed and puffed as we climbed the never-ending stairway. We stood in awe, mesmerised. The arduous climb was well-worth the view from the top. While taking a break at a tea stall, I looked over to see my friend engrossed in a conversation with fellow pilgrims. I joined them. 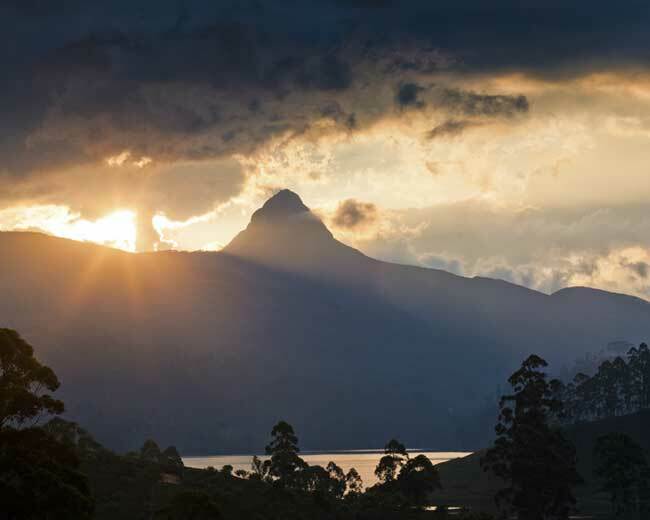 One of the pilgrims told us that Adam’s Peak stands at an altitude of 2,243 metres and is in the lap of nature with spectacular waterfalls and wilderness sanctuaries. But, what brings pilgrims of all faiths to the hillock is not its scenic beauty. Instead, it is a curious rock formation at its summit, known as the Sri Pada or the Sacred Footprint. 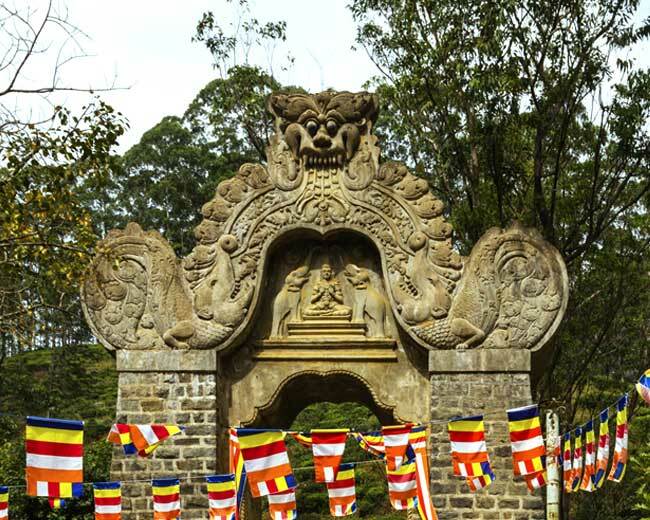 The pilgrim further explained that the Buddhists believe Sri Pada to be an impression made by the Buddha himself when he visited Sri Lanka. The Hindus on the other hand, believe the footprint belongs to Lord Shiva. Interestingly, Sri Pada is also equally significant in the Abrahamic religions. For the Christians and the Muslims, this rock depression is where Adam (the first man) set foot when he was exiled from the Garden of Eden. Therefore, pilgrims from all faiths visit Adam’s peak, and it symbolises the oneness of man despite religious differences. As if to live out what Adam’s Peak stands for, my friend and I effortlessly bonded with fellow pilgrims overnight while trekking towards the Sri Pada. Our nationalities, faiths, and beliefs took a back seat as we chatted, laughed and exchanged notes. While struggling to climb the last leg, we helped each other out, and even shared our midnight snacks and drinks. We saw each other not as a Hindu or a Muslim or a Christian or a Buddhist, but only as a fellow human being. At the break of dawn, together we conquered Adam’s Peak as we reached its summit. Sunrise is a must-see whilst on Adam’s peak, we were told. So, we sat ourselves down at a good spot and waited for the sun to rise. Sometime around 6, the golden rays of the early morning sun penetrated the clouds and tore down the thick veil of darkness. Soon after, the sun’s glorious heat dispelled the chilly air of the night. We stood in awe, mesmerised. The arduous climb was well-worth the view from the top. A little while later, my friend nudged me to accompany her to the Sri Pada. Housed within a tiny temple, the sacred footprint was covered with a huge stone slab. Bells chimed, as the early morning rituals began. Several of our pilgrim pals gathered around and some participated in the rituals, too, irrespective of their individual faiths. Before we parted ways, some of us exchanged numbers to stay in touch as friends. “Perhaps it is possible to overlook religious differences and stay united…,” my best friend commented as we walked towards our hotel. Her face shone with clarity. Smiling at her, I nodded in agreement.